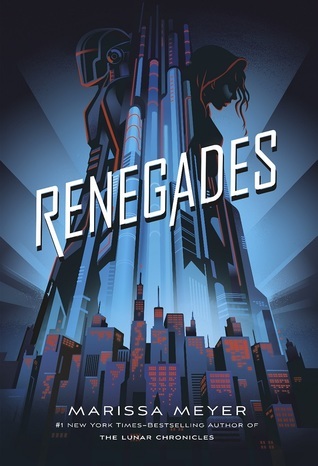 The Renegades are a group of powered individuals that had helped bring the city out of chaos from the Age of Anarchy. They're hailed as heroes and are working to rebuild everything that had been destroyed in the riots and loss of administration and government. Nova has as much reason to hate them as the other villains they had conquered, but they have no idea who she is. As a result, an elaborate scheme is hatched to discover the best way to take the Renegades out from the inside, if she can follow through with it. This book takes place in an alternate world where there are people who can develop superpowers of various types. These prodigies were once hunted down and killed out of fear. That all changed with the Age of Anarchy, and we get a very vivid look into the lives of the villains that the Renegades keep watch over. They're a little bit off of center but also humanized for the reader before we get to see the Renegades themselves. There's a large cast of characters, most with multiple names and identities as a result of most of them being a superhero. At the same time, we see a lot of the behind the scenes work that goes into superhero recruiting, training, outfitting and the rivalries between heroes. It's always fun to peek behind the curtain, so to speak, but here it takes on a bit more of a sinister undertone because of Nova's mission. I really liked Nova and the different feelings and loyalties that she held throughout the course of the story. Adrian was fun to get to know, as well as the rest of the team that Nova had initially fought. It doubled back in places and ended in such a surprising way, I hope this is the start to a series! I have questions regarding the ending and how it really changes the way you see the rest of the plot. If this is the start of a series, I eagerly await the next ones!